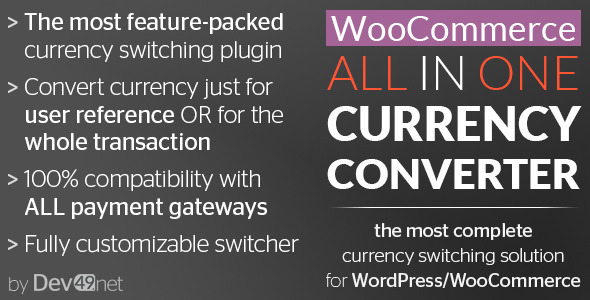 WooCommerce All in One Currency Converter is a must-have plugin for your WordPress-WooCommerce shop if you are selling to people from all over the world. This plugin allows your users to choose their preferred currency or sets it automatically using geolocation in your WooCommerce shop. 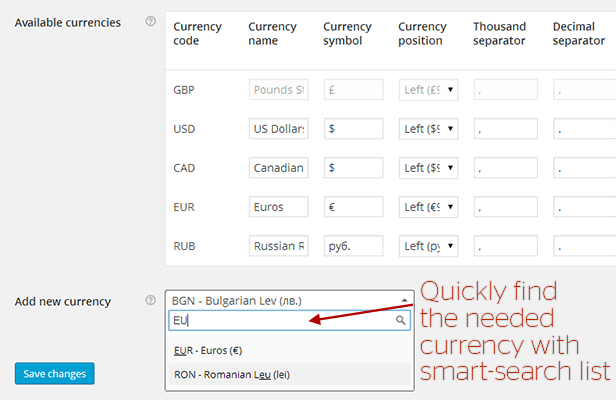 They can choose from currencies made available by you in plugin settings. Exchange rates updated automatically every 24 hours or manually. Every currency is customizable independently from the others – each can have different format, different number of decimals etc. Plugin uses WordPress filters and custom CSS rules to generate currency switcher, so you can tweak the currency switcher looks just with a little CSS and/or PHP knowledge.